Posted by Will Nelligan Published in 19th Century (1840-1880), General Opinion, What Would Lincoln Do? The letters Emerson was referring to – public letters – particularly rankled some 19th-century American opinion leaders. Douglas Wilson, a historian and two-time Lincoln Prize winner, notes in Lincoln’s Sword: The Presidency and the Power of Words (2007), that Lincoln’s unprecedented use of public letters was viewed by some as “undignified.” Lincoln was about as compelled by that criticism then as President Obama is now. The two presidents seem to share a desire to avoid, in Obama’s words, the “Washington echo chamber.” They both sought out mediums and messages that would do just that, resonating with everyday people and conveying a highly personal touch. In attempting to quench the desire to directly connect, Obama has the internet and Lincoln had the public letter. 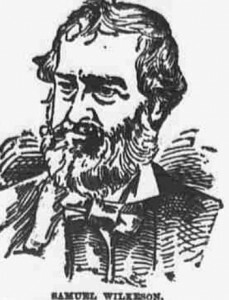 Beginning in 1862 with his letter to Horace Greeley and continuing in 1863 with longer missives to Erastus Corning and James Conkling, Lincoln shaped popular opinion and shared his views with constituents by “corresponding” through newspapers. His messages, on slavery, emancipation, and federal power, were circulated and read widely. The Conkling letter, which we recently annotated on Poetry Genius, includes Lincoln’s famous line stating that, “there can be no appeal from the ballot to the bullet,” and employs shifts in tone and argument to convince a broad swath of the political spectrum about the wisdom of the Emancipation Proclamation. Wilson, again in Lincoln’s Sword, argues that these public letters demonstrably helped improve the president’s popularity and support for the Union cause. A public letter to the editor of a newspaper or a political leader is a long way, however, from appearing on an internet comedy show hosted by the actor from Hangover 3. And it is worth noting that Lincoln’s public letters rarely employed humor in any substantive form. He was far from unfunny, though; in fact, in connecting with political leaders and laymen alike, Lincoln employed a similarly eclectic sense of humor that was also subject to criticism. In fact, some public figures attacked Lincoln for his humor in a way that will sound familiar to keen observers of the Between Two Ferns debate. 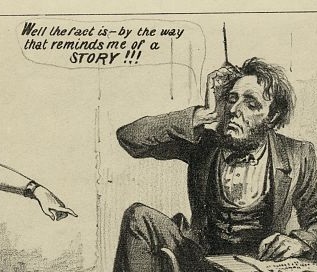 Historian Louis Masur has a great short post (“Lincoln Tells a Story”) at the New York Times Disunion series which details both some of Lincoln’s story-telling habits and the uneven reaction. He quotes Richard Henry Dana, a prominent nineteenth-century writer and attorney, who spoke for many New Englanders when he complained during the war that Lincoln “does not act or talk or feel like the ruler of a great empire in a great crisis.” In a scholarly article titled Lincoln’s Humor: An Analysis, Benjamin Thomas fully chronicles the 16th President’s flair for pith, wit, and tall tales. The article is a treasure trove of Lincolniana, ranging from yarns and one-liners to comic biography and commentary on 19th-century humor. Thomas notes that according to Henry C. Whitney, one of Lincoln’s friends from his Illinois years, “any remark, any incident brought from [Lincoln] an appropriate tale…he saw ludicrous elements in everything.” Thomas’s analysis is instructive, at least in one sense. After all, it is hard to imagine that the man who asked whether a Nebraska river named Weeping Water was called Minneboohoo by the Indians (“because Minnehaha is Laughing Water in their language”) would not have enjoyed at least some of Two Ferns banter about strange spider bites and 800-ounce babies. Lincoln didn’t lampoon Nebraska’s American Indian population in a public speeches or documents, though. Much of the humor Thomas describes appears to be drawn from personal interactions described in diary entries or recollections. The historian argues that after 1854, Lincoln’s public persona became more serious. O’Reilly, who has written a book on Lincoln, might have this fact in mind when he criticizes President Obama. O’Reilly could argue that as Lincoln ascended to power, he acknowledged the seriousness of the moment and changed the tone of his rhetoric. It is true that Lincoln’s rhetoric during the late 1850s and 1860s lacks some of the Springfield lawyer’s earlier folksy-funny style, but this shift did not help him shed a humorous public countenance. In the House Divided research engine, we feature several anti-Lincoln cartoons, like the one detailed above (“Columbia Demands Her Children”), which take him to task for not being serious enough (See also “Running the Machine” and “The Abolition Catastrophe” –all from the 1864 reelection campaign). These images seem to indicate that there were personal and political dimensions to Lincoln’s humor that extended well into the years of his presidency. It is never simple to compare different moments in history, but what is at the heart of President Obama’s appearance on Between Two Ferns – the desire to connect directly to citizens and convey a persuasive message – is familiar to all who study the history of American politics. Lincoln shared President Obama’s interest in communicating directly with the American public, and doing so in a way that was original and compelling. While his humor and desire to connect with voters do not converge in his public letters, Lincoln used both humor and public correspondence in the same way that President Obama used Between Two Ferns: to develop a personal rapport with constituents, and bolster their support for a national agenda. Few things are more presidential than that. Last year, nearly 750 participants signed up for a unique online learning experience. 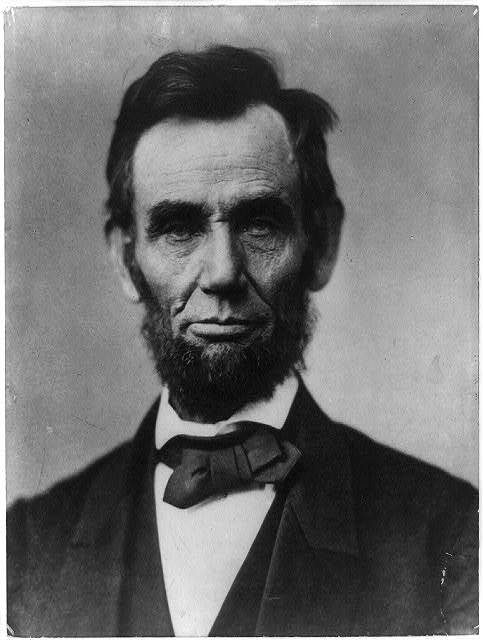 “Understanding Lincoln” was the first open, online graduate course offered in partnership between the House Divided Project at Dickinson College and the Gilder Lehrman Institute of American History. Taught by historian Matthew Pinsker, the course focused on classic Lincoln texts –not just his great speeches, but also his most important personal and political letters. The participants studied and debated these documents through a series of live, interactive online sessions and helped create a brand-new website: Lincoln’s Writings: The Multi-Media Edition. Now, as we are getting ready to launch the 2.0 version of this exciting course (REGISTRATION CLOSES ON MAY 27, 2014), we think it’s worth sharing some of the comments from those who joined us during Fall Semester 2013. 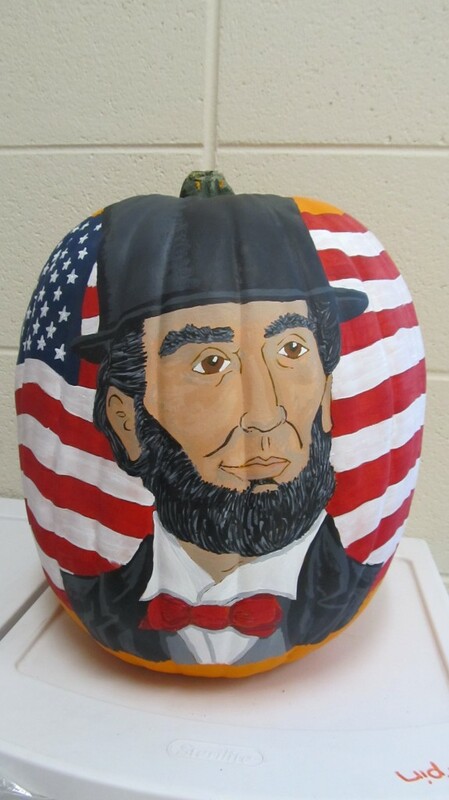 Registration for the 2014 edition of the “Understanding Lincoln” course will remain open until May 27, 2014. Full graduate student tuition costs $600. 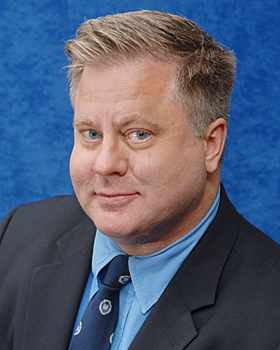 Auditors pay a small fee of $25. 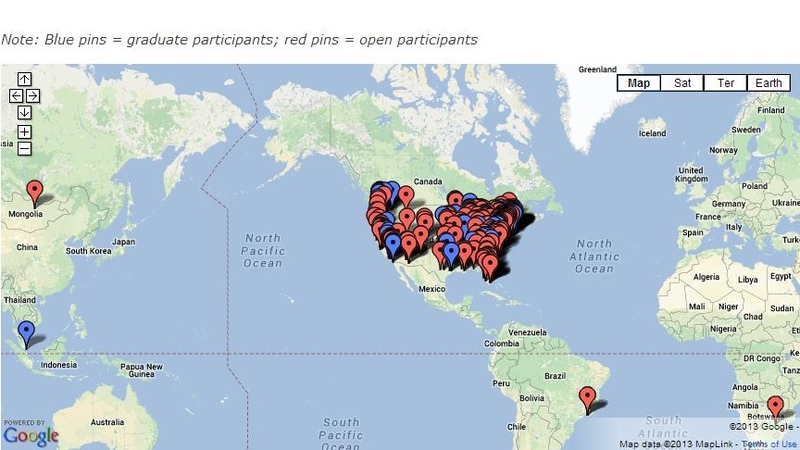 To sign up or to find out more details, go to the course registration page (http://gilderlehrman.org/programs-exhibitions/understanding-lincoln-graduate-course) and see for yourself. Last Friday, the Associated Press reported on the discovery of a previously unknown Abraham Lincoln document, and with it, a puzzling mystery. Addressed only to “My dear Sir,” a portion of the letter had been carefully removed, eliminating the key to understanding its meaning. Lincoln appears to have been writing “in haste” to someone asking if he or she could “keep up a correspondence” with an unknown person. “I like to know his views occasionally,” Lincoln wrote. 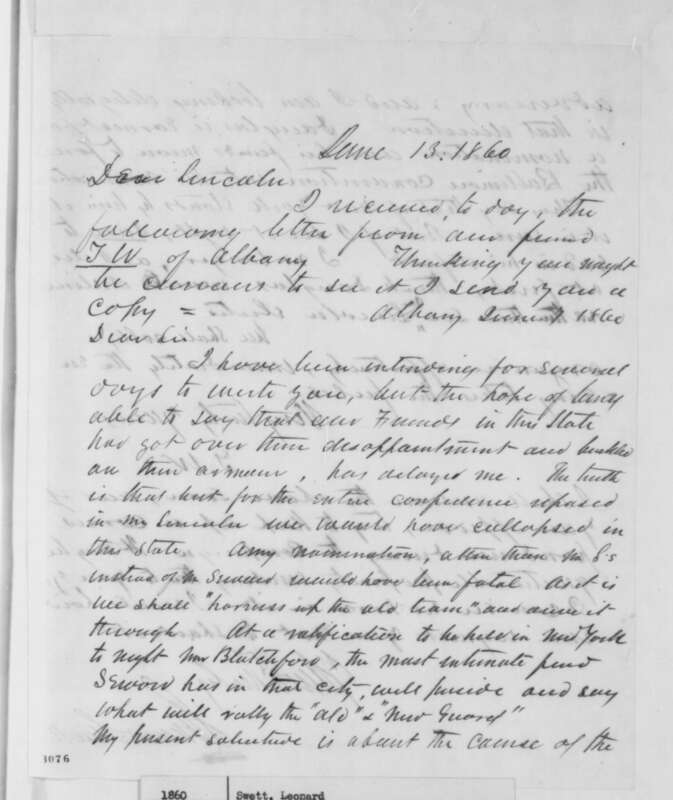 Researchers at the Papers of Abraham Lincoln project focused on the peculiar phrase, “keep up a correspondence,” and ran it through their database, matching it to a letter written to Lincoln by fellow Republican Leonard Swett in June 1860. In his note, Swett mentioned that he would “try to keep up a correspondence during the Campaign” with “our friend T W of Albany.” Researchers believe these initials refers to Thurlow Weed, the powerful editor of the Albany Evening Journal, a leading Republican newspaper from New York. During that period, Weed was essentially serving as a campaign manager for New York senator William Henry Seward, whom Lincoln had just defeated for the Republican presidential nomination in May 1860. 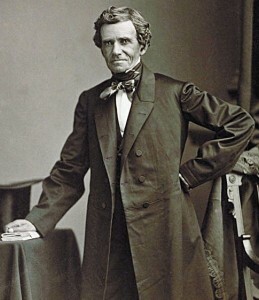 Candidate Lincoln needed full backing from Seward, Weed and their various supporters in the upcoming election but worried that he might not receive it because they were so disappointed over Seward’s unexpected defeat. This would explain why Lincoln and Swett wanted to keep close tabs on Weed and his views and why Lincoln may have sent the mysterious letter featured above. New letters and documents relating to Abraham Lincoln turn up more frequently than you might realize. Just a few weeks ago for Time magazine, House Divided Project director Matthew Pinsker highlighted some recent discoveries that give us powerful new insights into Lincoln. In 2008, scholars revealed that Lincoln had once fired off an angry letter to the editor of the Chicago Tribune which belittled another Republican politician as “Sister Burlingame” and which Pinsker calls “the angriest, nastiest written statement Lincoln ever produced.” Another newly discovered letter from 1859 reveals that Lincoln privately called slavery the only “living issue of the day” and wrote that it would be “idiotic” to think otherwise. Pinsker also points out that even something as monumental as the transcript for Lincoln’s very first national speech (1847) has only just recently been made available to scholars. For teachers and students using our Lincoln’s Writings: The Multi-Media Edition site, we’ve added a new tool to help you examine some of the best of these recent documents for yourself. Under the “Special Topics” heading, which can be found in the right-hand sidebar of every page, there is a link to “recently discovered documents.” As you browse each of these documents, you can also use the tags at the bottom of each page to find other related materials. In your quest for new Lincoln materials, however, always keep in mind that there are sometimes Lincoln forgeries in circulation, especially over the Internet. This problem has even fooled us before. Just remember that the most reputable sources for Lincoln documents remain the Collected Works of Abraham Lincoln and the Papers of Abraham Lincoln. And, of course, we’ll do our best to help navigate the truth as well. Created by participants in the “Understanding Lincoln” open online graduate course (offered in partnership with the Gilder Lehrman Institute of American History), this site (still in development) features 150 of Lincoln’s “most teachable” documents and offers a full array of multi-media resources designed to help teach them in the K-12 and undergraduate classroom. This site is especially useful for Common Core alignments. Created as part of the Lincoln Bicentennial anniversary, this site offers a snapshot of where the “Digital Lincoln” stood as of 2009, and includes a host of examples of research and presentation tools, especially designed for serious student and academic scholars. Created in part to help transform insights from James Oakes’s prize-winning study, Freedom National (2013) into use for the modern-day classroom, this site presents an array of primary and secondary source tools for studying the complicated but fascinating subject of emancipation and abolition. This “unofficial” guide includes access to Tony Kushner’s script, a full cast of characters (with photo comparisons to actual historical figures), and extensive analysis of the artistic license in the film and the historical reaction to Steven Spielberg’s important movie project. This site offers a clickable word cloud of the Lincoln-Douglas Debates and host of other rare primary sources for use in studying these critical texts. The House Divided Research Engine is a Drupal-based content management system that contains over 12,000 public domain images and tens of thousands of documents and other historical records. The link above takes users directly to Abraham Lincoln’s main record page and offers a well-curated gateway for Lincoln research. This short but compelling exhibit came together as part of the 150th anniversary of the Gettysburg Address and helps visitors understand the evolution of the document, including a sharp analysis of all five manuscript versions of the address in Lincoln’s handwriting. Dickinson College students Leah Miller and Will Nelligan helped create short but engaging tools for studying Lincoln’s most important autobiographical writing –a sketch he produced in late 1859 to help launch his presidential bid. There is a six minute YouTube video of the sketch and an annotated edition of it through the new platform at RapGenius. Michael Burlingame’s prize-winning Abraham Lincoln: A Life (2008) is the most important new multi-volume study of Lincoln, but it is difficult to teach because it is so lengthy. With permission, however, from both the author and the publisher (Johns Hopkins University Press), we have created short visually enhanced excerpts from the work that focus on the election of 1860 and include clickable footnotes, allowing teachers and students to “see” Burlingame’s sources directly. Created by technologist Rafael Alvarado, this mash up includes an integrated interface allowing users to see the online edition of Lincoln’s Collected Works (his known writings), Lincoln Day-By-Day (his daily schedule), and The Abraham Lincoln Papers At the Library of Congress (the bulk of his extant correspondence) for the essential “one-stop” shopping experience. There is nothing else quite like this “timemap” available on the Internet –a must-see for serious and aspiring scholars. Posted by Will Nelligan Published in Recent News, What Would Lincoln Do? You can read Wilentz’s articulations of that history yourself. What’s important for our purposes is what he says later about Abraham Lincoln. “As Lincoln well knew,” Wilentz writes in response to Tribe’s contention that presidents lack clear authority over the debt ceiling, “the executive, in times of national crisis, can invoke emergency powers to protect the Constitution.” There is certainly plenty of material in the annals of Lincolniana ( I just discovered the term) that supports this point, not least of which is Lincoln’s decision to suspend habeas corpus. The problem with the analogy (and, to some extent, the inherent problem with analogies) is that it misses out on important contextual questions. 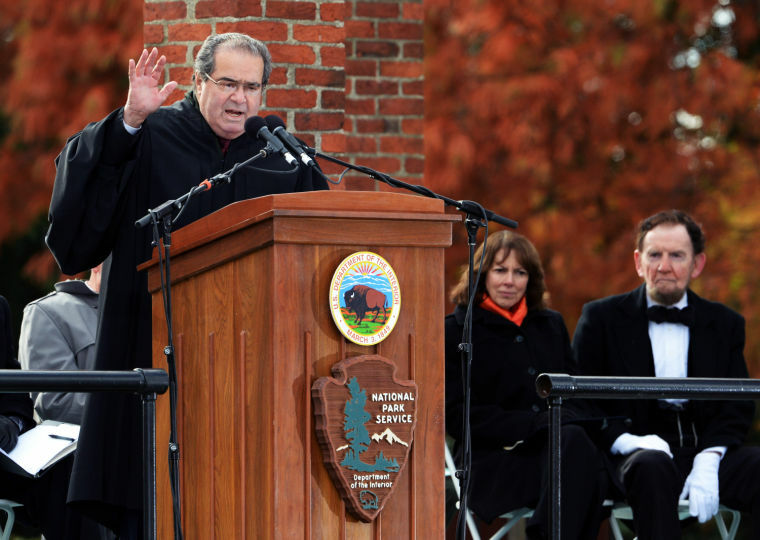 Perhaps we can all accept that Lincoln believed in “emergency powers,” but would he have termed this moment as such? Would a national default represent the same kind of political and constitutional conflagration that the Civil War did? I find it hard to label Wilentz’s piece an ‘abuse’ of the Lincoln moniker, but his comparative lack of attention to the substance of the Lincoln/Obama, Lincoln/debt ceiling analogy does suggest that he might have been searching for one more point to bolster the broader credibility of his argument. “What Would Lincoln Do? Understanding How Lincoln Gets Used (And Abused) in Today’s Washington” is a free public panel that will take place at Ford’s Theatre on Tuesday, October 15, 2013, from 12:30 p.m. to 1:30 p.m. Tickets may be reserved at http://www.fords.org/event/what-would-lincoln-do. Those who cannot attend the panel, may view it online starting on the evening of October 16. Information about where to obtain access to the video will be available through http://new.livestream.com/gilderlehrman/lincoln. Posted by Matthew Pinsker Published in History Online, Recent News, What Would Lincoln Do? I am moderating a special panel at Ford’s Theatre on Tuesday, October 15, 2013 from 12:30pm to 1:30pm on the always relevant topic of “What Would Lincoln Do? Understanding How Lincoln Gets Used (And Abused) in Today’s Washington.” This is part of the closing phase of the “Understanding Lincoln” online course (which the House Divided Project produces with the Gilder Lehrman Institute) but it is open to anybody who wants to attend in person or watch later on Vimeo or C-SPAN. You can find out all of the details –and reserve seats- here, but this post (the first in a series about the event) is designed to more fully introduce our notable panel of experts and provide some easy access to their published opinions on these matters. First, however, we should dispense with this shutdown business. Ford’s Theatre is closed as long as the shutdown lasts, but our panel will continue regardless. Ford’s Theatre has a new Center for Education & Leadership which is just across the street and which remains open to visitors. We can always relocate there on October 15 if the crisis does not get resolved. Michael Lind was one of the co-founders of the New America Foundation, a leading Washington DC think tank, which is co-sponsoring this event. His current policy focus is on economic growth, but he has authored several thought-provoking books on American political history, including an engaging study of Abraham Lincoln entitled, What Lincoln Believed: The Values and Convictions of America’s Greatest President (Doubleday, 2005). In this work, which the New York Times called “intellectually bold” and one that “will almost certainly change the way you think about America and one of its greatest presidents,” Lind argues that Lincoln’s core conviction was democratic self-government and that he should be known first and foremost as, “the Great Democrat.” Over the years, Lind has produced numerous books that invoke Lincoln’s legacy, but for the purposes of this panel, one of the most relevant was a short piece he authored for Salon in 2009, under the headline, “How would Lincoln vote today?”, which promised to reveal “where Lincoln really stood on the issues.” The bottom line of this eminently readable (and thoroughly debatable) piece is Lind’s assertion that Lincoln “might find himself more at home among Democrats focused on technology and economic growth” (um, like folks at the New America Foundation, perhaps?) and that most emphatically, “Nobody with Lincoln’s religious and political beliefs could be a conservative Republican” today. Who is the real Sam Wilkeson? As readers of Blog Divided are well aware, we have been fascinated by the story of Samuel and Bayard Wilkeson, a father and son who were both at Gettysburg, one as a correspondent for the New York Times and the other as a 2LT for the Union army. The son died on the battle’s first day after being wounded by an artillery shell and after amputating his own leg. The father discovered his son’s body on July 4, 1863 following more than a day of intense searching. Then he wrote a passionate, angry account of what happened for the New York Times, which closed by resolving that the dead at Gettysburg had “baptised” with their blood, the “second birth of Freedom in America.” President Lincoln knew the Wilkesons. The story of the family’s tragedy echoed across the North during the summer of 1863. So the connection to Lincoln’s famous phase in the Gettysburg Address, “a new birth of freedom,” seemed overwhelming, intentional, and eminently teachable. We first posted about the story of the “Angry Father” in July 2010, but then followed up with more details in the summer of 2013, here and here. I spoke about the Wilkeson family during the 150th anniversary commemorations for the Battle of Gettysburg and have been featuring the story in numerous K-12 workshops during the last five years, typically through this handout. Matthew Pinsker from Gettysburg Foundation on Vimeo. But there’s been one nagging concern that we just have not yet been able to fully resolve. 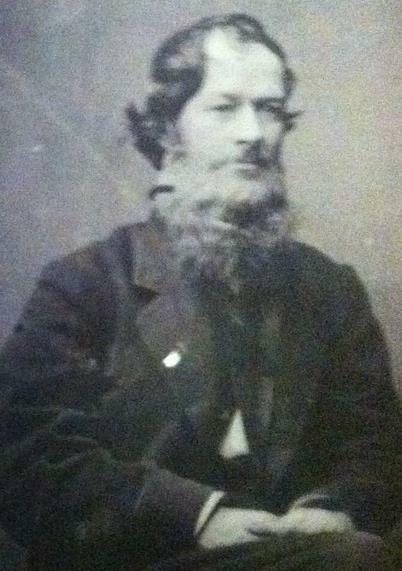 What exactly did Sam Wilkeson look like? The problem is that there are multiple images attributed to him but they don’t seem to align properly. I brought this up at the final seminar session of the “Understanding Lincoln” open, online course and asked for help, in true “class-sourcing” fashion. Remarkably, within a few hours, I got a very helpful lead from course participant Martha Bohnenberger, a social studies teacher from South Carolina. Here is the problem that first disturbed me in the summer of 2013. The House Divided Project has been using this striking 1859 image of Sam Wilkeson (on the top left) taken by Alexander Gardner, discovered and cleaned up by project co-founder John Osborne, courtesy of the online collections of the Smithsonian American Art Museum. Yet the Buffalo News profiled the Wilkesons this past summer because the family were Buffalo natives and they used the image on the top right –clearly not the same person– to represent Sam Wilkeson (undated, no source citation). I presume they obtained this photograph from the Buffalo History Museum, but I haven’t yet tracked it all down. 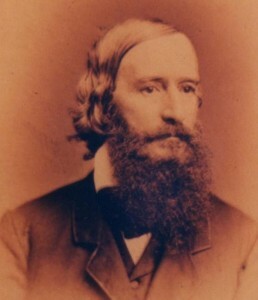 By the way, Buffalo was a nineteenth-century city partly founded by the grandfather in this story, Judge Samuel Wilkeson, Sr., who had hailed from Carlisle, Pennsylvania, where Dickinson College is located. However, there is even more about the image to consider. The Gettysburg National Military Park features the story of the Wilkesons inside their main museum experience at the Visitor’s Center, but they use an entirely different image reportedly of newspaper correspondent Sam Wilkeson, which they credit to the National Archives (on the bottom left). Meanwhile, Martha Bohnenberger discovered this illustration (bottom right) in the New York Sun from December 3, 1889 as part of an obituary for Wilkeson –read it, he led a truly remarkable life– by doing some shrewd online research at the Library of Congress site, Chronicling America. Again, it’s different. Now, I am not willing to bet my tenure on this, but I think that the Smithsonian Wilkeson (1859) is the same as the New York Sun Wilkeson (1889), just bearded in that latter illustration. The lines of the face, however, strike me as almost identical. But I don’t quite know what to make of the National Archives Wilkeson or the Buffalo News Wilkeson. The image quality isn’t quite good enough for me to decide, but they seem (especially the Buffalo Wilkeson) to be a different person (and probably different from each other as well). What do you think? There’s certainly more researching and phone calling to do, which I haven’t yet accomplished, but I appreciated the quick extra help from my class-sourcing exercise the other day and would like to continue to seek help if others would provide it. Feel free to comment here and leave your opinion, or contact me directly by email (pinskerm@dickinson.edu) to share any insights.